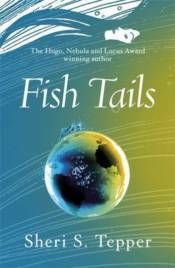 In FISH TAILS, two of Tepper's beloved characters - Abasio and Xulai (A PLAGUE OF ANGELS and THE WATERS RISING) - and their children travel from village to village scattered across the sparsely populated land of Tingawa. They are searching for others who might be interested in adopting their sea-dwelling lifestyle. Along their journey they encounter strange visitors from the far-off world of Lom, characters from Tepper's nine-book True Game series of novels - Mavin Manyshaped, Jinian Star-eye, and Silkhands the Healer - all of whom have been gathered up by an interfering, time-traveling, rule-breaking do-gooder to do one last good dead on earth before its metamorphosis is complete. For the waters are rising and will soon engulf the entire planet, transforming it utterly and irrevocably.